Biography of Jacob Riis, Photographer and "Emancipator of the Slums"
The "Emancipator of the Slums"
Jacob Riis was an investigative reporter and a pioneer in photo journalism at the dawn of the 20th century. He used photography to document the appalling conditions under which the poor were living in New York City. Riis knew that his photographs would evoke feelings of guilt that would make people feel some responsibility for the misfortunes of others and inspire them to take action to alleviate their suffering. Jacob August Riis was born in Denmark in 1849, and immigrated to the United States in 1870 at the age of 21. He arrived in New York City with no money, but like so many other immigrants, he was hoping to make his fortune in America. Unfortunately for Riis, America was in the middle of a depression in 1870, and many people were out of work and homeless. Riis managed to find a few odd jobs from time to time, but was unable to find steady work. There were many times that he didn’t have enough money for food or shelter and was forced to live on the streets. During the winter months he couldn’t sleep outside, so he had to utilize the only option for shelter available to people at that time who had no money—a police lodging house. They were dirty and crowded, and people had to sleep on the bare floor, on newspapers or a plank of wood, but at least they had a roof over their head. After several months of hunger and homelessness Riis was in total despair. One cold and rainy night, he sat at the river’s edge and began to contemplate suicide. After all he thought, no one would notice and no one would care. Then, as he later wrote in his autobiography The Making of an American (1901), a little dog who had befriended him the day before and had followed him around ever since, "crept upon my knees and licked my face…and the love of the little beast thawed the icicles in my heart." Well, at least the little dog cared about him. The little dog’s affection lifted his spirits enough so that he was able to go on. Later that night, Riis was forced by the cold to take refuge in a police lodging house. He tried to sneak the little dog in under his coat, but the desk sergeant saw and made him put it outside. As he slept, Riis was robbed of a small gold locket that he had saved and treasured as a memento from home. He complained to the desk sergeant who got very angry, accused Riis of being a liar, and ordered one of his officers to throw him out. The little dog had been waiting outside the door all night. When he saw Riis being pushed out the door by the policeman, he bit the officer on the leg. The policeman grabbed the dog and smashed his head against the steps. This incident could have been the thing that finally pushed Riis over the edge, but instead it transformed his despair into anger. He vowed that somehow he would find a way to avenge the death of that little dog. Soon thereafter he began writing a book he called Hard Times. His "hard times" continued for a while, but one day his life was changed forever when an acquaintance who ran a telegraph school told him about a job. He said a man who ran a news agency was looking for a "bright young fellow whom he could break in" and offered to write a letter of introduction for him. Riis was hired by the agency and soon demonstrated a talent for writing. Then he acquired a camera and taught himself photography. By 1877, his reputation had grown so that he was hired as a police reporter for the New York Tribune and the Associated Press. His beat was Police Headquarters on Mulberry Street, one of the worst slums in the city. In 1887, he read about the invention of the magnesium flash and he was one of the first photographers to use flash powder. That enabled him to photograph the tenement interiors and the streets and back alleys of the slums at night. In 1888, Riis left the Tribune and was hired as a photo journalist by the New York Evening Sun where he began his crusade in earnest to publicize the plight of the poor. 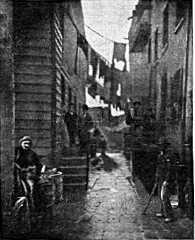 Riis’ work while at the Sun and his first book, How the Other Half Lives; Studies Among the Tenements of New York, published in 1890, were an international sensation. His evocative writing coupled with his revealing photographs were a powerful indictment of society’s indifference to the plight of the poor. Riis was an advocate for the immigrant poor, the oppressed, the exploited, and the downtrodden. He wrote that the poor were victims of economic slavery and that they were the "victims rather than the makers of their fate." He also believed that poverty and misfortune were responsible for criminal behavior. He blamed much of the misery and crime present in the slums on the greed of landlords and building speculators. Riis called it "premeditated murder as large-scale economic speculation." His reporting inspired shock and horror among New York’s rich and middle classes. His book also captured the interest of the New York Police Commissioner, Theodore Roosevelt, who would later become governor and then the 26th president of the United States. Riis took Roosevelt with him on his forays into the dark corners of the city. 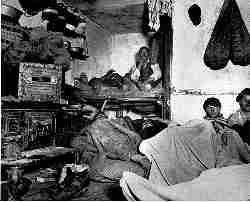 When Roosevelt became governor he closed down the police lodging houses, and led the fight to enact many reforms. Roosevelt called Riis "the most useful citizen of New York." Riis continued to write and lecture on the problems of the poor for the rest of his life. He wrote several other books; including Children of the Poor (1892), Out of Mulberry Street (1898), The Battle With the Slum (1902), Children of the Tenement (1903), and his autobiography, The Making of an American (1901). Riis conducted "magic lantern" shows in cities all over America, where he projected his photos onto a large screen. One newspaper reported, "His viewers moaned, shuddered, fainted and even talked to the photographs he projected, reacting to the slides not as images, but as a reality that transported the New York slum world directly into the lecture hall." 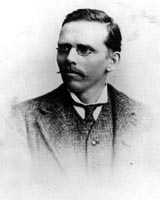 Jacob Riis has been credited with precipitating many of the reforms that improved the living conditions of the poor during what is now known as the Progressive Era. Health and sanitation laws were passed and enforced. Landlords were forced to make repairs and improvements. 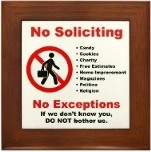 Laws were passed requiring modern improvements to new residential construction. The Mulberry Bend slums were eventually razed, largely due to his efforts. He also started the Tenement House Commission and the Jacob A. Riis Settlement House. By the time he died in Barrie, Massachusetts, on May 26, 1914, he was known as the "Emancipator of the Slums." His work has proven to be an invaluable resource to historians and social scientists ever since, but many of his photographs would be lost today if it weren’t for a photographer and historian named Alexander Alland. In 1946, he searched for and found Riis’s original glass plate negatives in the attic of the Riis family home right before it was to be torn down. They are now part of the collection of the Museum of the City of New York. Riis’ magnificent contributions to the betterment of living conditions for the immigrant poor might never have happened, were it not for the love of that little dog. He always concluded his lectures with the declaration, "My dog did not die unavenged!" and no one will ever disagree with that.